How Do I Disassemble Dexter Locks? Garage door openers have an emergency release that disconnects the door trolley from the carriage in case of a power outage. This enables you to operate the door manually until power is restored. Sometimes, though, the emergency latch might not work, especially if it has never been used or is full of dirt. Getting a garage door open even when the emergency latch won’t work requires removing the arm connecting the door to the opener. The door arm is actually two pieces consisting of a curved piece and a straight one. 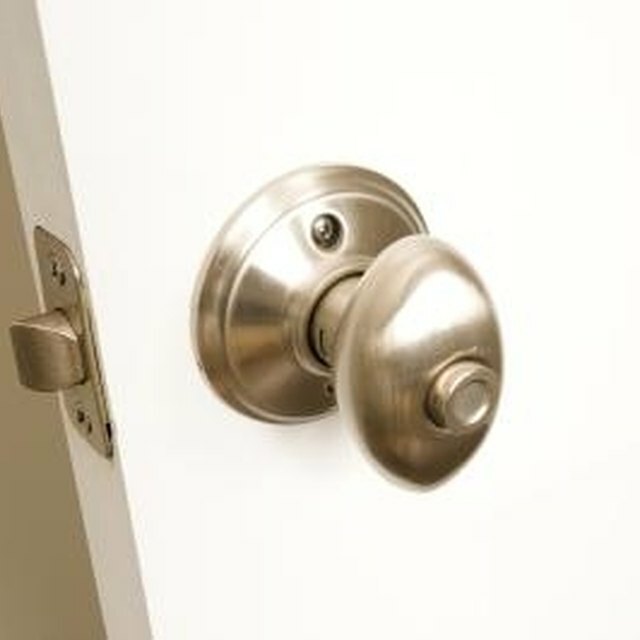 Loosen the two bolts securing the curved door arm to the straight arm with a socket wrench. The straight arm connects from the opener carriage to the curve arm. The bolts only require loosening; do not remove them. Remove the cotter pin or ring secure the pin holding the straight arm to the opener carriage. The ring removes much like taking a key off your key ring. The cotter pin requires straightening the ends with a pair of needle-nose pliers and pulling it out of the securing pin. Hold the garage door opener arm in one hand and pull the securing pin out with your free hand. Remove the pin securing the door arm to the bracket at the top of the door. Remove the arm completely and set it in a safe place until you reinstall it on the door. How do I Install a Buzzer Door Lock?